Free Sample of Kabrita Formula! When the kids were little, they both had problems taking most formulas. If you’ve been a reader for a while, you know I have IGT, so that meant that my breastfeeding experience was limited. But, a baby’s gotta eat, right? Yeah, so enter Kabrita. It’s made from Goat Milk, so it’s great for little tummies that can’t handle lactose (that was my kiddos issue), and another bonus: it smells like milk. If you’ve ever formula fed, you know the gross “formula smell”. 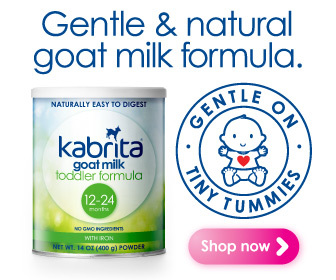 Kabrita Goat Milk formula smells like milk. It pours like milk, and yes, it tastes like milk too- yes I have tasted it. And if your kiddos like it, you can use that awesome $5 off coupon that comes with your sample. Locally, it’s sold at Sprouts.